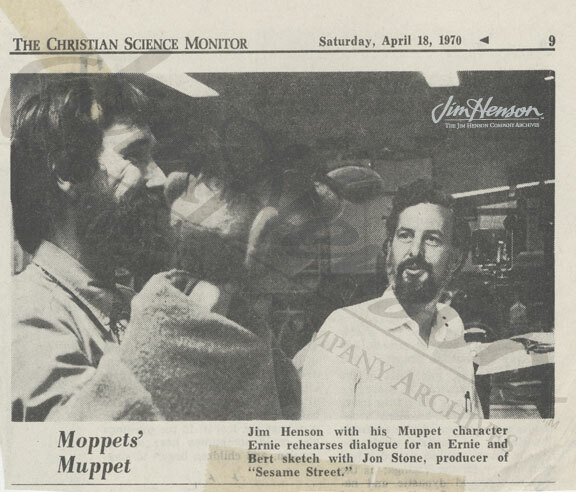 Jim’s relationship with Sesame Street creator Jon Stone dated back to 1965 when they first worked together on a potential Saturday morning television project. 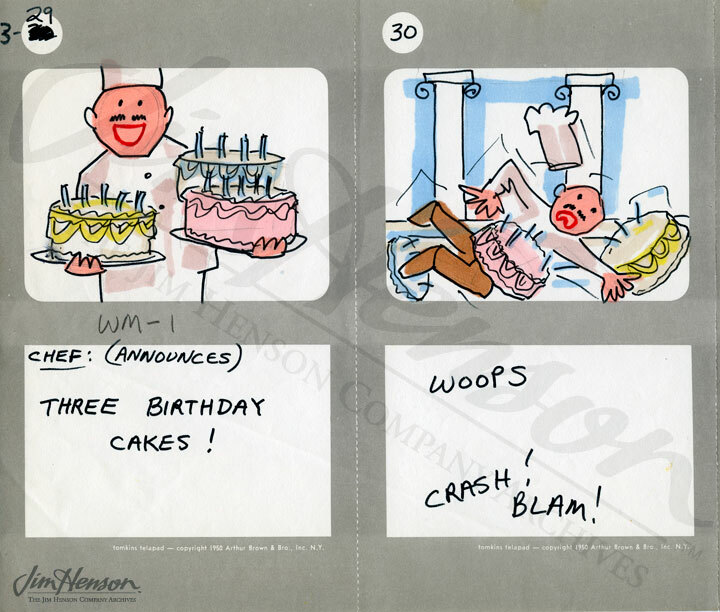 Jim and Jerry Juhl had been trying to develop a show based on their Tales of The Tinkerdee fairytale characters, and Jon Stone was working with writer Tom Whedon to create a series with similar themes. Stone and Whedon wrote a script for a Cinderella-based comedy pilot and with Jim providing the characters and performances, videotaped it. It never aired but was the first step toward Jim’s television special, Hey Cinderella! that was shot in 1968. The same year, Jim enlisted Stone to direct Youth ’68, his documentary for NBC exploring youth culture. Clearly they worked well together and had a mutual admiration for their respective talents. Around that time, Stone was also working with Joan Ganz Cooney on the development of Sesame Street. They knew they wanted puppets, and Stone felt that Jim was the only one that would fill the bill. Jon also knew that Jim, by then a father of four small children, was interested in what pre-schoolers got from television and how the medium might be stretched to provide something truly educational that children would enjoy. Starting in 1967, as part of the show development, Cooney and her colleague at the Children’s Television Workshop Lloyd Morrisett hosted a series of meetings with television experts and academic advisors. In the summer of 1968, a series of curriculum seminars were organized and Jim was invited along with other artists, educators and television people to attend one in New York and one a week later at Harvard University. These served as his introduction to the main ideas and goals of the show and the personalities behind it. Most likely, it was during one of these seminars that he first encountered Maurice Sendak who was busily doodling during the proceedings. The next six months was filled with production of other shows, appearances, pitches to the networks, and a move to new office/workshop space. Working with Jon Stone in January 1969, Jim shot a presentation with Rowlf and Kermit explaining the idea behind the Children’s Television Workshop project and poking fun at the difficulty in settling on a name for the show. 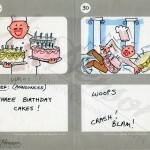 In the late spring, Jim began work on his first series of counting films for CTW featuring the beleaguered chef who was always falling down the stairs and started designing the Muppet characters specific to the show. 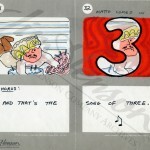 And the following July, the first Sesame Street pilot shows were shot. Jim and Jon Stone in the Christian Science Monitor, April 18, 1970. 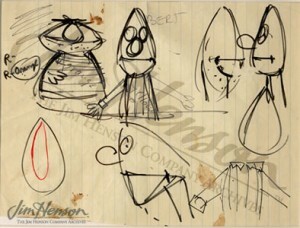 Jim’s original design for Ernie and Bert, 1969. 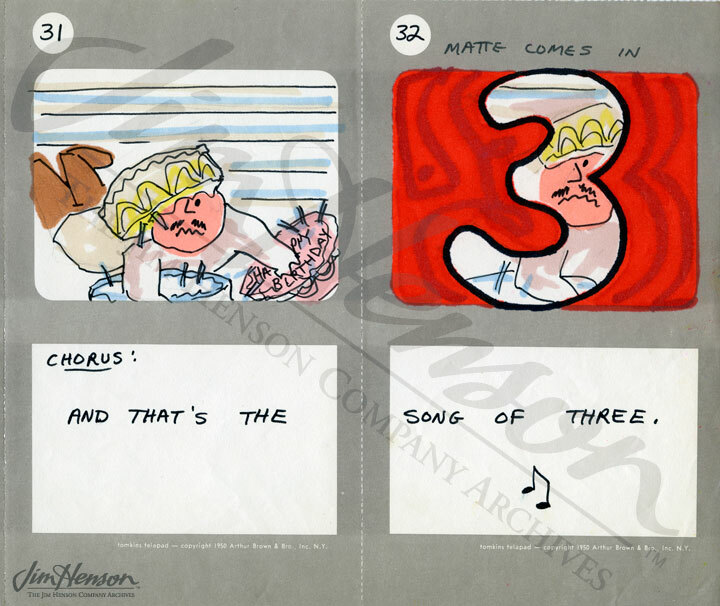 Storyboard panels for Jim’s #3 Chef counting film, 1969. This entry was posted in 07-July '68, 1968, Appearances, Sesame Street, Tales of The Tinkerdee, Youth 68 and tagged Cambridge, Children's Television Workshop, Harvard, Hey Cinderella, Jerry Juhl, Joan Ganz Cooney, Jon Stone, Kermit, Lloyd Morrisett, Maurice Sendak, Rowlf, Tom Whedon. Bookmark the permalink.